I’d categorize my family as cookie monsters. And the bigger the cookie, the better. This Skillet Chocolate Chip Cookie was a huge hit x 4! About a week after I whipped these up for dessert, the hubby, in a most serious tone, commented, “You know that skillet chocolate chip cookie you made? You can make it again anytime.” He is a chocolate chip cookie aficionado. They must be chewy and chock full of chocolate chips. Semi-sweet preferred. This was not rocket science, just an easy recipe in a new vessel. 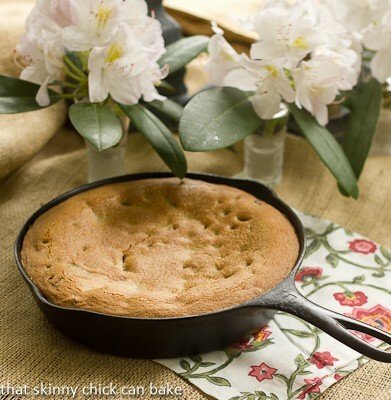 Using mini cast iron skillets allowed each recipient to have their own personal pan cookie, but this recipe can also be baked in a single skillet and cut into wedges. I used four 5-inch cast iron skillets this time, but you can utilize what you have at home. 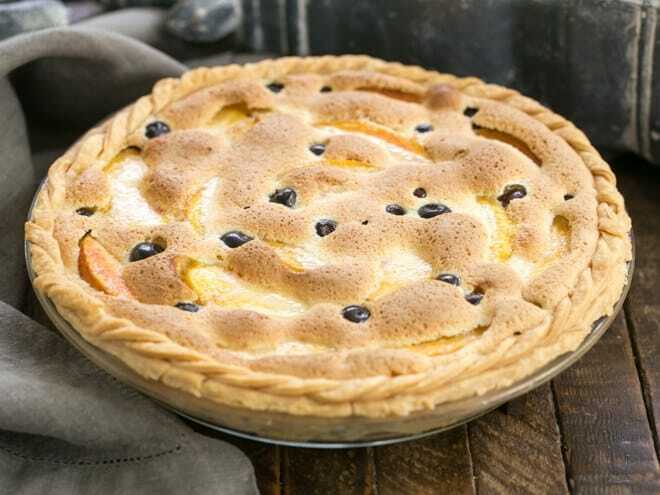 A 9-inch skillet makes a really thick cookie, and the wedges look like slices of pie! A 12-inch will make a thinner cookie, just adjust your cooking time. The cookie should be golden brown and set in the middle. I don’t mind them slightly underdone—that just makes them gooier! If you prefer a variety of chocolate chips or nuts in your chocolate chip cookies, go right ahead and tweak to your preferences. I love to serve these slightly warm with a scoop of vanilla and drizzle of fudge sauce. I have a feeling your family will ask for a repeat performance from you, too. 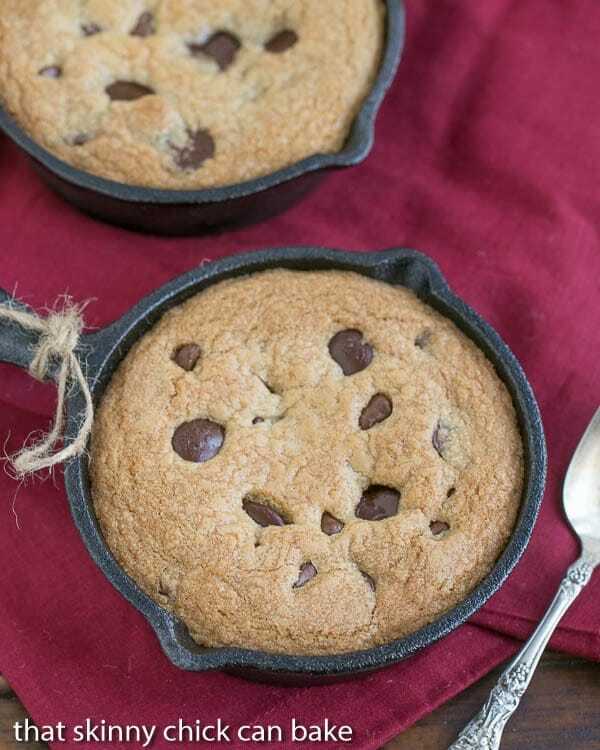 Your favorite chocolate chip cookie baked in a skillet! 1 ¼ cups chocolate chips (use your favorite or a variety which could include milk chocolate chips, semisweet chocolate chips or bittersweet chocolate chips). Preheat oven to 375º. Lightly spray 4 5-inch cast iron skillets with nonstick cooking spray. Set aside. In a large microwave-safe bowl, melt butter. Add sugar and brown sugar, and vanilla. Mix till combined. Add egg and egg yolk, whisk until mixture is smooth. Add flour, baking soda, and salt, and stir until combined. Mix in chocolate chips. Spread cookie dough into prepared pans. Bake for about 20 minutes or until golden brown. a 9-inch skillet could take 25-30 minutes. Cool slightly before cutting or serving. Serve with vanilla ice cream and fudge sauce if desired. We prefer our skillet cookie slightly underdone. If you want a less gooey center, cook for a few minutes longer. The following giveaway has ended. And to counteract the butter, sugar and chocolate with which I have been tempting you, I have some exciting news. 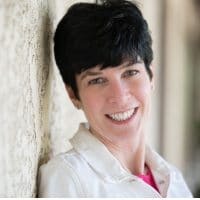 The nice folks at Albion Fit, who are purveyors of fantastic women’s fitness and swimwear, have offered my readers a chance to win the same sleek White Zip-front Hooded Jacket that I’ve been wearing constantly since it arrived on my doorstep. Perfect to throw on over my yoga clothes, I love the little zipper pocket on the sleeve for my id and extra length for my long torso. The white is perfect for all my summer fitness needs…I need to keep moving so I can keep on baking! I practically live in workout wear, and Albion Fit’s quality is phenomenal. Made by women for women, you’ll love all their stylish options. To enter to win this marvelous white workout jacket, please “like” Albion Fitness on Facebook, then pin your favorite item from the Albion Fit website and leave a link to your pin in the comments. To gain a second entry, please pin any one of my food photos, and leave a second comment with a link to that pin. Unfortunately, this offer is limited to those with a valid US mailing list, who are 18 years and older, and who have not won an Ambion Fit giveaway in the past 6 months. This giveaway will run from today, Monday, June 10 through Monday, June 17, 2013. Winner has 48 hours to reply or an alternate winner will be drawn. Besides this giveaway, Albion has offered my readers an exclusive promotion for 15% off any purchase over $50 if you use the code skinnychick15 . This code is valid through Thursday, June 13, 2013. Disclaimer: I was provided with a workout jacket for review. Albion Fit is providing the same item to one reader. Opinions voiced are my own. The top two photos of workout clothing are courtesy of Albion Fit. 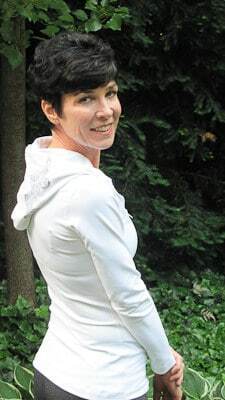 Update: Congrats to Janelle, the winner of this nifty workout jacket! What a fantastic cookie recipe and an awesome giveaway. I liked Albion Fitness on facebook and pinned. Here’s the link to my pin. Above are my two links, Liz. Beautiful model in that white jacket! You look great in that jacket. We have no qualms about raw cookie dough. Maybe we should? I always go for the skillet cookie when I need cookies but am too lazy to make the individuals. Shhh, don’t tell anyone, but I don’t have a cast-iron skillet! (other than my LC grill pan). I’ve made chocolate chip cookies in a jelly-roll pan, but need to try this thicker version. You look adorable in the jacket! Pinned your cookie too. I love skillet cookies! I need to get a skillet, I love how thick and chewy your cookie turned out! This is one SERIOUS cookie, love it! Wow, this looks amazing, Liz! So soft, chewy and perfect for topping with ice cream. I love it! Hahahaaa boys are funny. 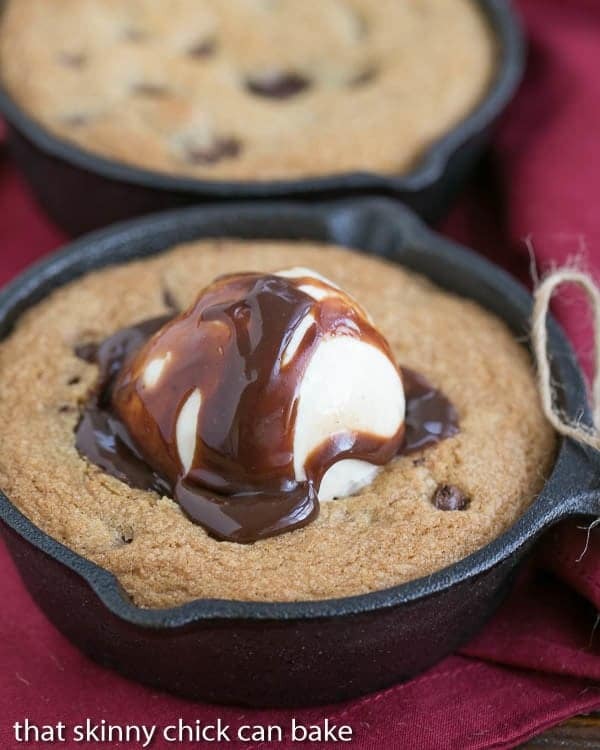 This skillet cookie doooes look tasty! 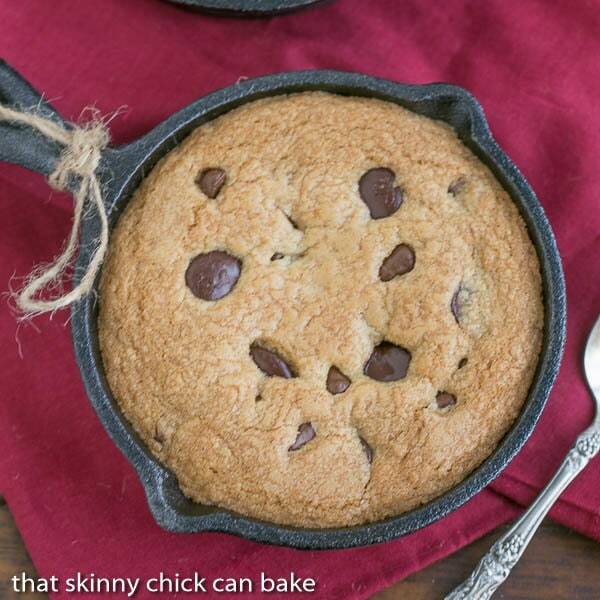 A skillet cookie!? UMMMMM…did I just die and go to heaven? Lookin’ good, Liz, in your white hoodie! And hells yeah to this skillet cookie. 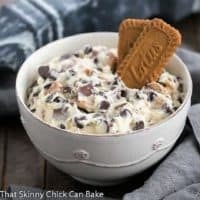 Seeing all the skillet cookies on the blogs lately has been driving me crazy! I have a beautiful lodge cast iron pan at home that I bought over a year ago and have never used. I’m nuts, right?! I’m intimidated by the seasoning aspect but I’ve been dying to use it. First thing I’m making is this cookie. And then I’ll cry because my body isn’t fit enough to wear one of these adorable swimsuits! Oh, Dudette would love that cookie…though I’d have to use the milk chocolate over semi-sweet. Very nice. It looks amazing. Love chocolate chip cookies! Will have to try it skillet style. 🙂 Have lovely week Liz! I’ve been looking for mini skillets to make cookies in but no luck yet. I will hold on to this recipe until I find them. You are rocking that jacket!!! 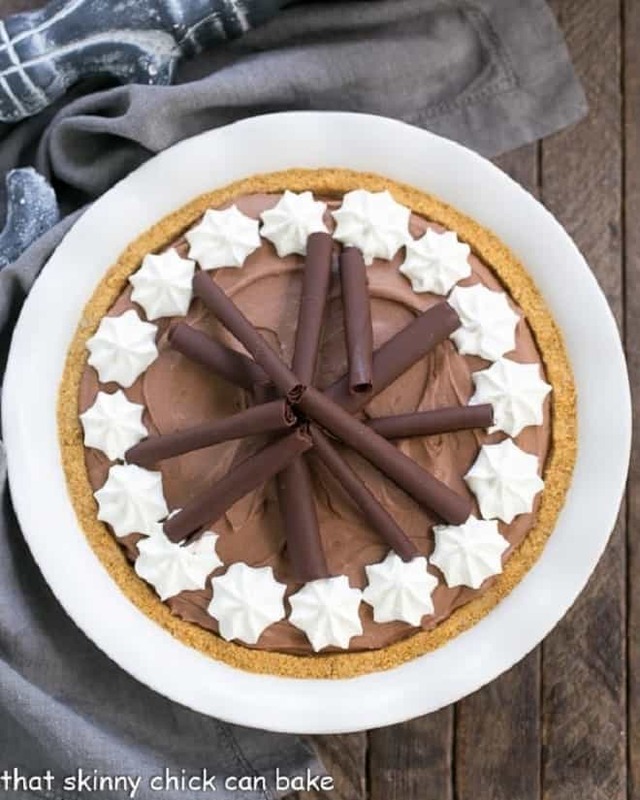 OMG, does that look amazing? My friend Barb, from Profiteroles and Ponytails told me about a skillet chocolate chip cookie she and her hubby had in a restaurant a few years ago but I’ve never seen a recipe for it. It looks just perfect, chewy, chocolatey…did you serve it warm? I’ve got four little square cast iron skillets that would be perfect for this! Lis, this brings me back to the days of when I mad cc cookies in a pizza pan for my kids to take to school on their birthdays. They were so good. I love cc cookies, too! Need to get this skillet asap! Looks delicious! Haha, your husband is just so much like my husband, I can’t get over it! I should totally make this…my man would love it too 🙂 Looks delish! My hubby has been bugging me to bake a skillet chocolate chip cookie! I’ve pinned this to try later. No one in my family has ever gotten sick from cookie dough and there’s been a lot of cookie dough eaten. Have a great week. the skillet cake is divinelicious!!! I am afraid that one single slice would not be enough for me. 🙂 Liz: You’ re gorgeous and look even fitter in that jacket. i love a skillet chocolate chip cookie!! yours looks sooooo delicious! I love chocolate chip cookies in a skillet!! with a heaping scoop of ice cream of course! I’ve only made a mini version, but I can see why I should make a jumbo version! Would love to win this jacket! I love how wonderfully thick this is!!! The skillet cookie looks fantastic! You look GREAT in that jacket, Liz. 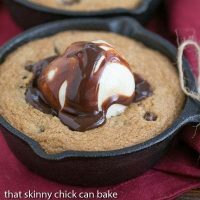 Hubby’s are usually right when they are all out on a recipe and this chocolate chip skillet cookie looks hearty enough for a man. However, if you look at the slope of the slices it looks like beautiful women’s high heeled pumps. I think you are the cutest little model of the bunch! Liz, after this gorgeous sweet treat you show us a bathing suit??? 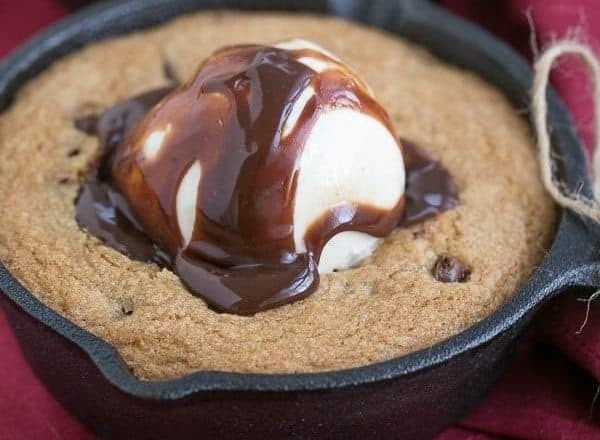 Frankly, even this hasn’t spoilt my appetite 😉 The skillet cookie looks fabulous. We love chocolate chip cookies and I’ve never tried making one in a cast iron skillet. I think my grandkids would think I am very clever if I make this for them. Great idea, Lizzy. That cute jacket looks fantastic on you! Hi Lizzy…your skillet chocolate chip cookies look and must taste chewy and totally droolworthy delicious. 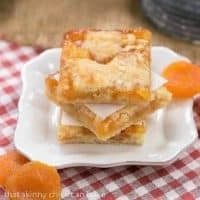 As soon as I get back from Italy, I must try this; so incredibly easy to make! If it’s ‘Bill’ approved, it must be Good! 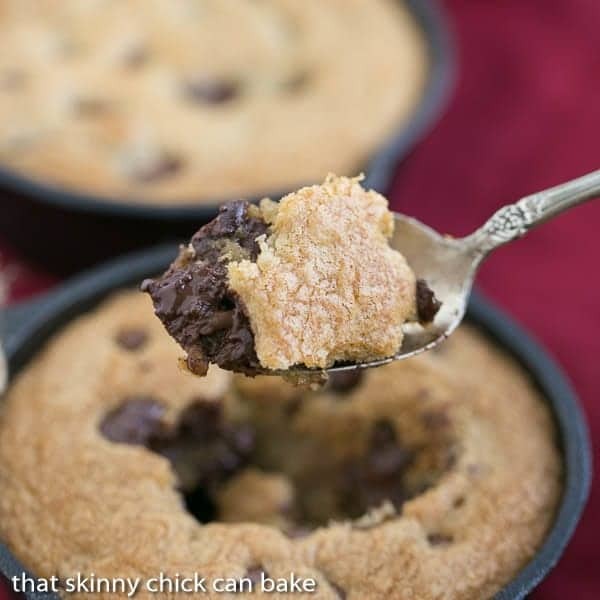 Skillet cookies sounds good to me! And you look awesome in that white jacket! That delights cookie skillet, I never did or ate, but I found it very tasty and different. It will be done soon. My friend you are beautiful with the white coat and skinny and a beautiful supermodel. 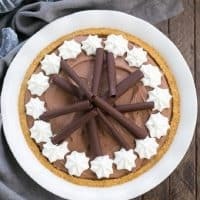 This huge cookie is the ultimate comfort food dessert! Don’t let me close to that skillet, or I’ll eat the whole thingn (the cookie pie, that is). 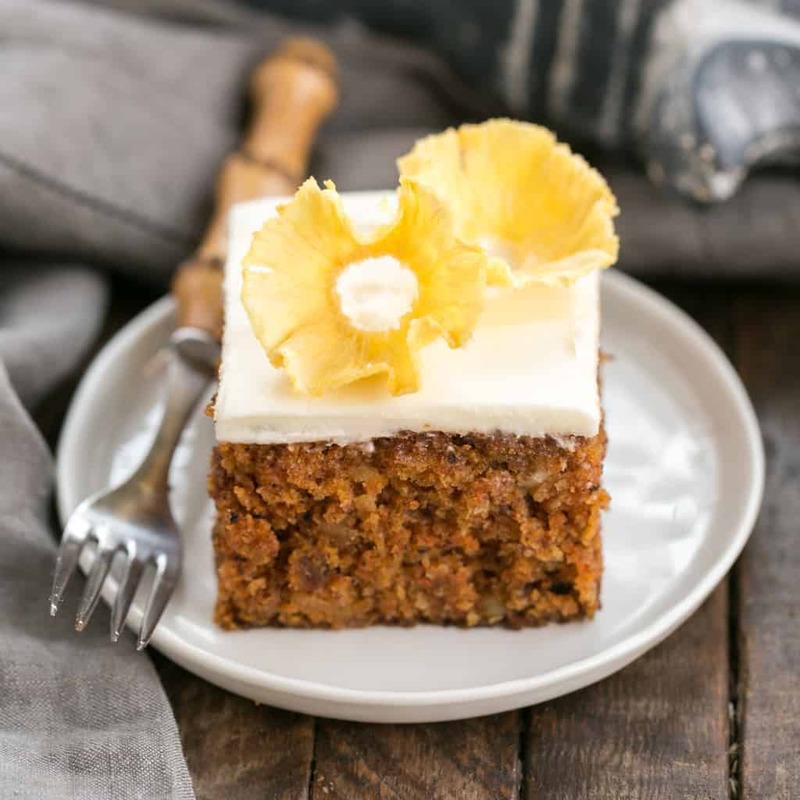 Here is my second link … I adore apple cake and can’t wait to try apple brownies. Yum! That’s one easy and great idea for chocolate chip cookies! 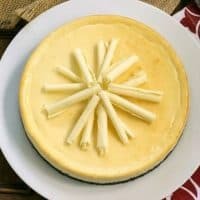 I pinned one of your recipes. For my second entry I choose your snicklerdoodles. You know I love all your recipes, I was between this and the pancakes because are the once I make more frequently. Liz, you look just like our music teacher at my Elementary School. ADORABLE. Yummy! Sounds and looks delicious! Must try. Love the jacket on you!! Hope you are having a fab weekend and Summer! Yummy! Hot cookie with cold ice cream! Liz- I’m a little confused about recipe. In your paragraph you say you used 4 5-inch skillets, but in the directions it says 4 9- inch skillets. Before I order the 5 inch skillets from Amazon, I just wanted to make sure that’s the size you used. So cute! Can’t wait to try this! Hi, Lyn! I’ve been the typo queen today. You’re right, that should be 4 5-inch skillets, but you can easily use just one 9 or even 10-inch skillet if you’d like. But the minis are definitely cuter!